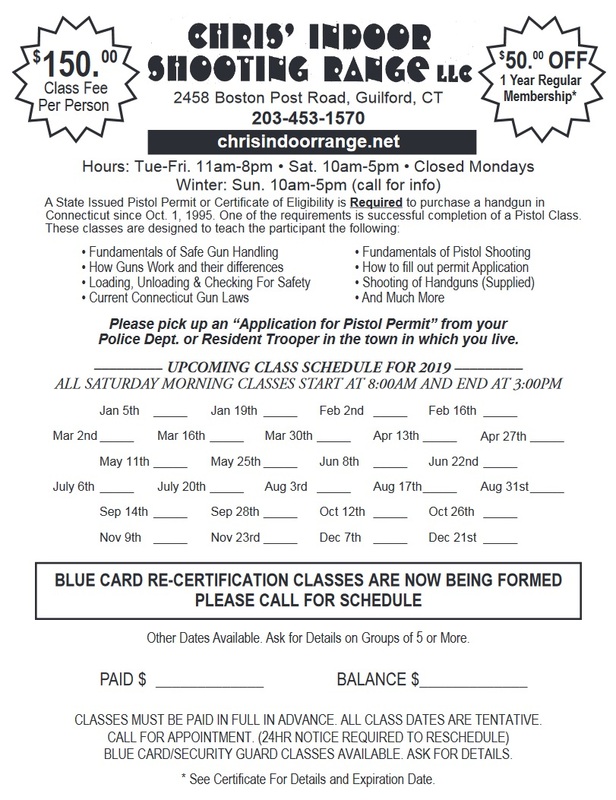 Receive the permit you need to legally purchase a gun in Connecticut by signing up for the pistol permit classes available at Chris Indoor Range & Gun Shop. You’ll be welcomed by our experienced staff and taught the basics of safe gun handling and the responsibilities of owning a pistol in our safe, friendly, clean, clear, and non-smoking environment. You’ll also love our affordable prices and commitment to information and safety – something you just won’t find at chain stores. Sign up for our pistol permit class today! All Saturday morning classes start at 8:00 AM and end at 2:00 PM. Other dates are available as well. Contact us to ask for details on groups of 5 or more. Pistol permit classes must be paid in full in advance. 24-hour prior notice is required to reschedule a class. Blue card re-certification classes are done in a one-on-one format. Call for an appointment. Due to current local and worldwide events, the pistol permit classes are filling up very quickly. More Saturday and Sunday classes have been added for your convenience. Call us today for the current schedule.